The commercial success of Frostpunk, released on April 24th 2018, was reflected in the strong financial performance delivered by 11 bit studios S.A. “The game had an impressive launch. Frostpunk quickly moved to top positions on bestseller lists of the world’s most important digital platforms, headed by Steam. In just 66 hours from the launch, fans bought 250,000 copies of Frostpunk, which more than covered our expenses to develop the game,” notes Grzegorz Miechowski, President of the Management Board of 11 bit studios S.A. The Company’s strong performance in 2018 was also supported by Moonlighter (released on May 29th) and This War of Mine. “Moonlighter, a game we published, topped the best-sellers’ list on Steam, a major achievement for a low-budget game of this size,” Miechowski added. He believes the success of Moonlighter attests to the strong competence of 11 bit studios S.A. in providing marketing and other support to independent developers, opening the door for rapid growth in publishing. 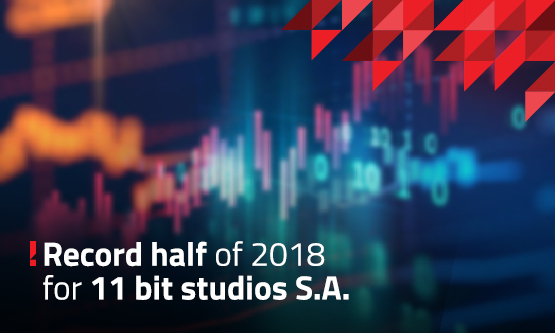 In the first half of 2018, 11 bit studios S.A. generated revenue of PLN 45.72m, which represented a year-on-year increase of 428.45%. The Company’s operating profit increased by 899.35% to PLN 30.18m. Net profit increased almost 91-fold on the prior year, to PLN 24.92m. “The figure would be still higher if it were not for non-cash provisions related to the implementation of the 2017–2019 Incentive Scheme and provisions for annual bonuses for staff. The results were further affected by royalties due to the developer of Moonlighter on sales of the game in the first half of 2018,” Miechowski explains. He says these charges totalled in excess of PLN 8m. Strong cash resources were a testimony to the Company’s robust financial standing, with the Company holding in aggregate PLN 51.3m of cash in bank accounts, bank deposits and other financial instruments. Almost PLN 12.7m in trade receivables that are regularly converted into cash should be added to this figure. Miechowski believes the success of Frostpunk and Moonlighter should support the rapid pace of growth in future periods. “We intend to expand our development resources with the goal of having three independent development teams, each working on a different title, available to us in a few years’ time,” he declares. In the publishing segment, the Company is set to increase the number of new releases of games developed by third parties, to drive the segment’s revenue. In the near future, 11 bit studios S.A. will concentrate on further development of Frostpunk. It will also step up work on Projekt 8 and a DLC for This War of Mine. The publishing division is making preparations for the release of Children of Morta, which has attracted strong interest from players and the media, suggesting its significant commercial potential. In the next few months, TWoM will be released for the widely popular game console Nintendo Switch. ‘Beat Cop, Moonlighter and Children of Morta will also be brought to Nintendo Switch, which proves we are ready and able to seize all available opportunities to monetise our titles,” Miechowski concludes.